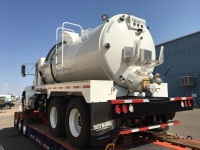 APN supplies Dust Abatement / Water Tanker Trucks to Government Agencies. All of our outstanding trucks are engineered in-house, allowing us to customize your tanks and accessories, to your specifications, on whatever Chassis you choose. Everything is managed under one roof: planning, engineering, fabrication & assembly, finishing, testing & delivery–to make sure your truck is built right from start to finish.